Shocking photos and videos circulating in mainstream and online media of the January 13th grounding of the “unsinkable” Costa Concordia. More than 4,000 people were on board when the ship hit rocks off the shores of the island of Giglio, Italy. Given the size of this passenger ship, we can’t help but think back to the sinking of the Titantic. Cora reads about the sinking, as yet unaware that James and Patrick were on board (ITV). Downton Abbey fans recall the series opening shot of the tapping telegraph which carried news of the Titantic which directly impacted the Crawley family. The unsinkable ship had sunk. As Lord Grantham observed: “Every mountain is unclimbable until someone climbs it, so the ship is unsinkable until it sinks.” It also would appear that every fortune is safe until it is not. Unbeknowst to the family, Robert’s cousin James Crawley and his son Patrick were passengers on that ship. The unthinkable happened: two heirs were lost at sea. That the news would be relayed to them so quickly (well as quickly as a telegrams and a bicycle) by the family solicitors would make my father (the lawyer) proud. If you are a cynic you will roll your eyes at the convenient timing of events, but the rest of us love the story line. We are given a definitive point in history which we can comprehend, and are off on an excellent adventure with the Grantham family. There is another connection between Downton Abbey and the Titanic. It is more widely known in the UK that the creators of Downton Abbey will be launching a new 4 part mini-series about Titanic called Titanic 2012 in the Spring. This will conveniently tie in with the 100th anniversary of the sinking on April 14, 2012. Isn’t promotion a wonderful thing? 3/22 Update: The Titanic mini-series launched in Canada on March 21st. It will run weekly until the finale on April 14th. In the UK the series will air on ITV starting March 25 at 9 PM, and in the US it will run on ABC on April 14 (Episodes 1-3) and April 15th. After one episode, I found the series lacking something, but it got better with age: my review. Now that you are aware that the 100th anniversary of the sinking of the Titanic is near, there will be a flurry of events paying tribute with dinner menus featuring the last meal. Call it a party but should be viewed more like a tribute since lives were lost just hours after the last meal. If you plan to have one it might be a good idea to start testing recipes now. A Guide to Titanic Recipes: I have worked through the printed menus which survived the tragedy and there is something to inspire all cooks from first, second and steerage menus. Check the “Titanic Menu” tab at the top of this page to navigate to other posts on this subject. I have also built links between posts. Follow this link to find all the Titanic recipes. Some of the recipes come from this great cookbook Last Dinner on the Titanic. To order your own copy, click the applicable US, Canada and UK link. Here is what you might expect at a dining experience out, the chef inspired by this book. First Class: there was a private party in first class on that fatal night, but the others in first class enjoyed a grand 10 course meal. Second Class passengers ate a less elaborate but beautifully served dinner. In steerage, third-class passengers ate simply prepared, but hearty meals served in their own saloon. I actually attended a steerage event years ago whch was hosted by a local eatery/night club in an historial building. I recall that the food served in steering was pretty good. I do remember the ladies room was directly beneath the dance floor and the shaking and creaking of the floor boards made the the image of being on the Titanic all the more real. It reminded me of the below deck dance scenes from the famous movie. If you lost your own copy (I have no idea who my husband loaned our copy to), you might want to pick up a new copy of Titanic (Widescreen) and skip all the cooking! The first class menu is pretty ambitious, but cooking is about fun, so let’s start with dessert! Waldorf pudding and Peaches in Chartreuse Jelly which was served as part of the tenth course. Eclairs were also served with French ice cream. You can find those recipes here. 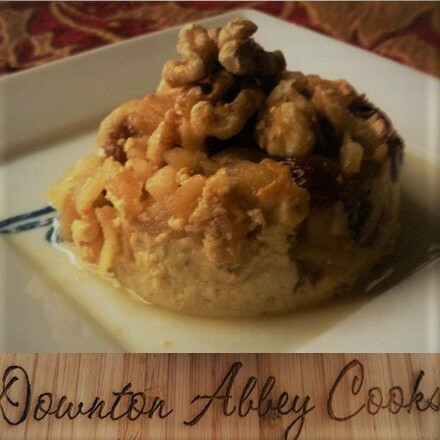 Waldolf pudding is a simple custard dessert with apples and walnuts which was famously served on the Titanic. Stir together apples, raisins, lemon juice, and ginger. Stir in 2 Tbsp. of the sugar. Cook for a few minutes until the apples are carmelized. Divide apples amongst 6 1 cup ramekins which have been oiled. Place milk in a medium saucepan set over medium heat and heat milk until it bubbles. Take some hot milk and add to the eggs, mix and then pour the egg mixture into the saucepan, whisking constantly until thoroughly blended, add the remaining sugar and keep mixing over heat until the mixture starts to thicken a bit. It should look like a sauce. Add the nutmeg, vanilla, and mix well. Pour over apple mixture. 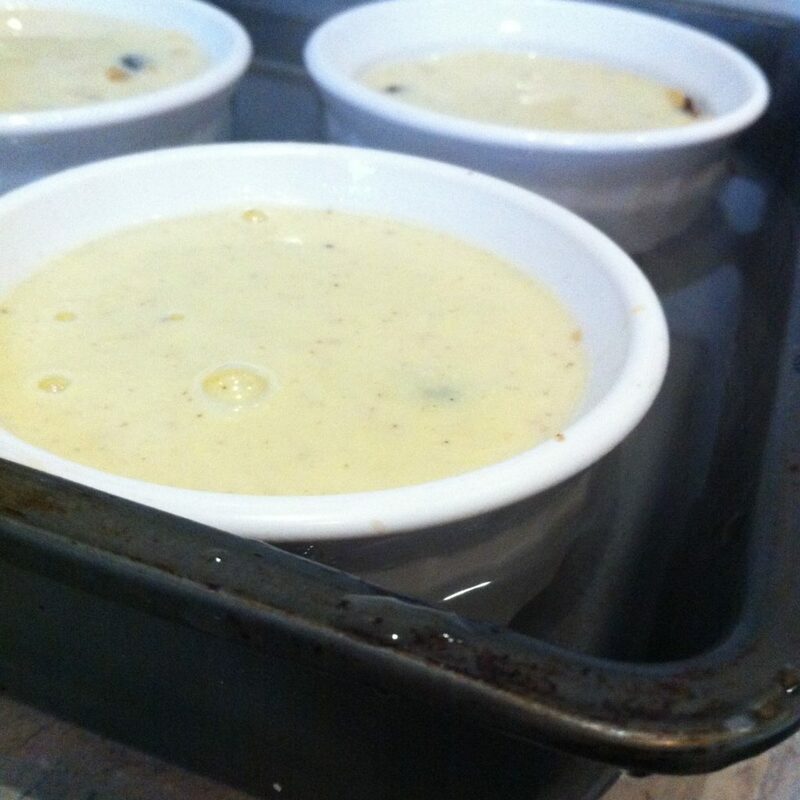 Set the ramekins inside large roasting pan and Prepare a bain-marie (water bath) by pour enough boling water in roasting pan to come halfway up sides of ramekins. This will gently cook the custard. 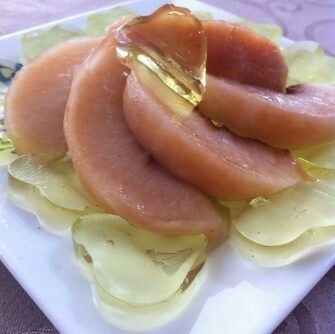 Peaches in Chartreuse Jelly was served as a dessert course in 1st class on the last night of the ill fated voyage of Titanic. Pour into a 9? x 13? glass baking dish lined with waxed paper; refrigerate until completely set. Immerse the peaches in a large pot of boiling water for about 30 seconds; then immediately transfer them to cold water. Slip off the skins, and cut them in half and remove stones. Add the prepared peaches making sure they are entirely immersed; cut a piece of parchment slightly smaller than the pot and place over the top of the peaches to make sure the remain submerged, or use a plate or a smaller lid and place in the pot. Bring the syrup to a boil and reduce the heat to medium-low and poach the peaches gently for 6 minutes or until soft (they should be easy to cut into with a spoon). Allow the peaches to cool in the syrup. This may be stored for 24 hours in the refrigerator. To serve, turn out the jelly onto a cutting board and carefully remove wax paper, and roughly chop 2/3rds of jelly with knife or edge of large spoon. Divide broken jelly amongst 6 dessert plates. using a knife or cookie cutter, cut remaining third of jelly into decorative shapes. Use a spatula to arrange shapes around the outer edge of each bed of jelly. Meanwhile in 2nd class, diners enjoyed plum pudding wine jelly, American ice cream and “cocoanut” sandwiches. This dish was a challenge to research. I have found a couple of Indian recipes in newspaper archives of the time which are literally sandwiches filled with coconut…yuck! Indian influences were seen on the 2nd class menu (Curried Chicken and Rice), but let’s just stick to a standard butter cookie sandwich. Using electric mixer, beat butter until light; add sugar and continue beating at medium-high for 5 minutes or until light and fluffy. Add vanilla and egg, beating until well combined. On low speed, mix in flour, coconut, and nutmeg just until well blended. Shape dough into ball, wrap tightly, and refrigerate for 1 to 2 hours or until chilled through. On lightly floured surface, roll out dough, one-quarter at a time, to 1/8 inch thickness. Using floured 2-inch round fluted cutter, cut out rounds. Using floured palate knife or metal spatula, place on greased baking sheet. Lightly brush each cookie with beaten egg white. Bake in 350 F oven for 8 to 10 minutes or until golden brown on bottoms. Remove to rack; cool completely. Meanwhile, cream together shortening and butter, adding icing sugar gradually until mixture is creamy. Stir in coconut and vanilla. Spread equal amounts of filling evenly over half the wafers and top with remaining wafers to make sandwiches. Store in tightly covered container for up to 1 week. See, that really wasn’t that hard? Mrs. Patmore would be proud of your efforts in the kitchen! This sweet treat can grace your tea tray or party sweet dish with distinction. It was served to 2nd class passengers as part of the dessert course on April 12, 1912. On lightly floured surface, roll out dough, one-quarter at a time, to 1/8 inch thickness. Using floured 2-inch round fluted cutter, cut out 28 rounds.